A bit of color to the end of January, which proved to be a fabulous month! This is another lariat I made because I couldn't resist the lovely colors, especially the green one. It fills my soul with sunshine and incites lovely thoughts of green valleys speckled with fragrant flowers. Oh spring... where art thou? 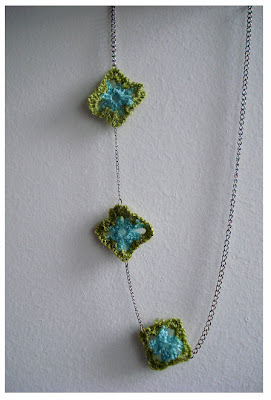 Do you remember the carnation necklace I made few months back? Well that thing got itself into the center of attention back then, and I still get compliments especially if I wear it with contrasting tops. So, a while ago I decided to enhance the pattern a bit further. I kept its original design, but I changed the ends of the tube and made the braided part thicker and longer. As for the flower part I put three flowers instead of one, so now the necklace has a more luxurious and ravishing appearance. I like it so much I am planning to try the design with some other fabric. Welcome to my old blog with a new, hip and fashionable looks! I freshened up some htmls, meddled with pixels, once I even thought I wiped out this blog from the face of the Blogo-sphere. However all this would not have happened if I haven't landed on the blog of the very talented Kendra. She has a series of bloggy posts about using all the important issues of blog design that sometimes make the blogger's life a living hell, and that upon seeing all the html, px, rss feeds and other wording I wonder the language it is in. But after following this fabulous tutorial I started to love those little abbreviations. I have long wanted to expand that cluttered and claustrophobic place so I was really joyous when the instructions proved to be quite a revelation. Made several mistakes but managed to straight things up. It took a while, but it was totally worth it!! And if you don't want to fiddle with it yourself or don't have the time Kendra is also designing blogs so she might do it for you! My mother used to treasure keepsakes. They were most often clothes. Clothes me and my sister wore as babies or toddlers. Clothes that have emotional and sentimental value. A dress, a cape, lace socks, blankets. Things like that. And not many of them, but several, carefully selected pieces that are truly worth treasuring. Things that were created with love and affection. Hiding in a wooden box I dug out these two lovely things. A knit dress in a pale shade of dusky rose. It is created by my grandma's hands according to her design. The upper part has a lace resembling bodice while the lower part is made in a gorgeous pattern I still didn't decipher. Well, that woman had magic in her hands and made wondrous things whether it was the crafts, the food or the home. I am amazed at the tiny stitches and the compactness of the dress after all these years. One thing is for sure - I am not letting it go. Then there is this amazing cape. She had made this combining a soft white yarn with silk floss / thread, thus the cape obtains a fabulous effect and is really remarkable. I am proud to say that when Eva was a baby she wore the cape a lot and we received many compliments on the craftsmanship. There is a blanket in the same pattern and yarn to match the cape, but I don't really remember where I have stored that. Anyway, this is the week when I am airing and washing all keepsakes so there would be more of these treasures coming up in future posts. During the weekend we went to take our children who were visiting their grandparents. It started snowing on Saturday and by Sunday everything was covered with the white snow blanket. Winter, being a master painter created its most marvelous scenery. Doesn't the forest look enchanted? Congratulations Divya! I'll contact you for details. At the mention of the word a picture creates in my mind. A bit of fresh breath in a winter morning, and a drop of color to a grey painted sky laden with heavy clouds. I love lariats. They make me feel special, romantic and elegant. 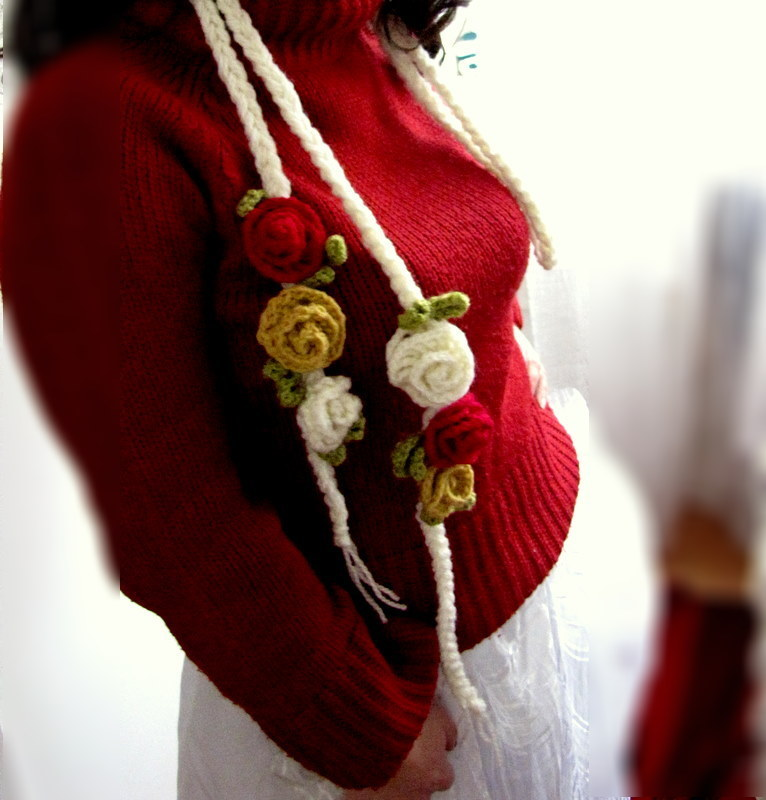 I made this one in chunky white yarn, embellished with two sets of flowers all in different colors. Enjoyed making the roses especially the red ones which make a fabulous contrast to the white background. As I already mentioned in my last post, bra pads are one of the best background/ surfaces for building up jewelry and accessories. I employed my needle and embroidery floss for this one. I embroidered directly onto the pad, and added ribbons on both ends. I made the ribbons quite long so I could tie it on my neck. Versatile enough for me! You didn't believe the title?! Well it's true. You are looking at my newest creation - The bra pad necklace a.k.a Steam punk galore. The latter sounds more refined but the essential material is a bit raw. Many bras usually come with pads which if you don't use, can be fabulously repurposed. The filling inside is already covered and serged so these pads open a whole new field of alternative use. For this project you need two (or three pads). As you see I got rid of the black one. Join both pads by sewing them together at the back. Next, let your imagination free and dive into your stash of beads, ribbons, sequins, buttons and such! Work on the design by combining the lot. I used my woolen beads, one of my carnations (I have a ton of those) a piece of tulle. Take a metal chain, sew it behind and there you go! I also made a bracelet (and/or a choker). Showing it tomorrow. Today I've got something I think you are going to like. For the necklaces I am showing below, I used the wires of a brassiere. I cannot stand the poking and jabbing of the underwire and I always take the wire as soon as I buy the brassiere. And you guess right. I never get rid of them. So here is what I made with a pair. but stop near the edges and secure by tying. Crochet some flat flowers. I made two of each color. stitch all around to secure it. Crochet two strings and attach them to both sides of the wire. Thus the length is adjustable. And your new necklace is ready! Then there is this one. ruffled the tube and sewed the ends. Then I took a piece of lace, ruffled that too. I added a decorative vintage button and stitched the piece on the tube. At the back I sewed two silk ribbons for tying. It didn't take me more then 10 minutes to do this one. Tips: For the tube you may use any already made edging of sweaters, sweatshirts or such. Just cut the length you need and ruffle it. Or you may wrap a ribbon (or else) around the wire. Instead of lace you may embellish it with whatever suits your fancy! That's it for today. Come tomorrow. I have prepared more for you. There is a giveaway still in progress. You are welcome to my shop. I've opened it a while ago, but as life is unusually unpredictable I couldn't dedicate myself more on it and promote it appropriately. For those who are familiar with my work there won't be many new things, but I would appreciate if you browse through it and tell me your sentiments. As to make the promotion more interesting I am giving away this crocheted flower necklace for your kind comments and as a "thank you" for your time. 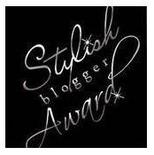 Sweet Emer and Nat have passed on the Stylish award to me! I have to say I was pleasantly surprised - Thank you ladies! I won't play the right way of the tag game, instead here's an unorthodox twist of it. I am supposed to nominate people for the award. Those stylish people have always been present here. Look no further but my bar on the right. The award goes to them! And don't forget to check my Burda pal links below the sideshow (on the right). Those are the people who can really take the attribute! Just a glimpse of my new creations. 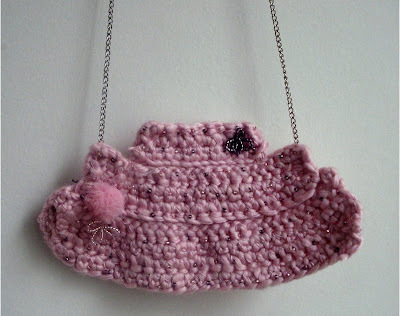 The necklace made of woolen beads I am so proud of. A necklace composed of three mini grannies strung on a chain. This one is quite catchy and effective. It is actually a bib necklace, crocheted and beaded by yours truly. More little treasures coming soon. Stay tuned. I like creating one of a kind jewelry, incorporating interesting methods and techniques, using a broad variety of materials created by the generous nature and others made by men. When it comes to fabric accessories, nothing inspires me more than beautiful fabric and the feeling is complete if it is expressive, vivid (and vintage). For this necklace I used one of my vintage scarves This is a variation of a necklace I've already made and it is shown somewhere here with the same pattern because the scarves appealed to me so much at the time I bought three of them in the same color. After "blasting" my sewing machine, every little stitch on this one is made by hand, it took a lot of time and during the creation process I never stopped feeling sorrowful for all our ancestors who in the past sewed clothes by hand. Makes you appreciate more the commodities of the modern world.